Dining al fresco is only part of the fun. The dinner party really starts to sizzle when you serve the entire cooking experience outside! An outdoor kitchen not only allows you to cook, eat and entertain without having to book a reservation but it also expands your living space. Not to mention, a well-designed outdoor kitchen will allow you to enjoy cooking and dining outside beyond the summer months. Incorporating traditional kitchen elements to your outdoor kitchen is a great way to add versatility, value, and fun to your space. Here are a few of my must-haves for creating the perfect outdoor kitchen. Designing the floor layout and material of your outdoor kitchen is essential to building the foundation of your amazing outdoor space. When making your selections, be aware of the different weather in our area, as well as the overall weight of the appliances you are installing. Flooring such as polished marble or granite will be slippery and slick when wet and may not hold up to oil or food stains. The right flooring will not only complete the overall look of your outdoor kitchen but will also add durability and value to the end product. Milestone Tip: When designing a project of this scale, remember that safety comes first. Outdoor kitchens are typically located near wet surfaces like swimming pools and spa tubs. Be sure to choose materials that meet safety criteria, stay away from flooring that may be too slippery or rugged, and select a material that can handle food spills and grease. Ceramic tiles or porcelain outdoor tiles are the best option in this area. Where you decide to place your outdoor kitchen depends on several factors. First off, you’ll want to make sure that smoke from the grill doesn’t drift back into the home. It’s wise to have a good idea of the general wind pattern in your yard so you can set the grill appropriately. Secondly, if you like to entertain you want to engage with your guests and won’t want to walk a long distance from the indoor kitchen to the outside. Consider placing your grill and outdoor kitchen near the entrance to the inside kitchen. Lastly, if you want to preserve the view you currently have from inside the house to the outside, you’ll want to design your outdoor kitchen to the side or at an angle. This way, you don’t obstruct your view from the inside of your home. Just like an indoor kitchen, the outdoor kitchen is full of hazards so place your kitchen in the right area of your backyard. The right planning will help ensure that your outdoor kitchen is in the right location for your yard. Milestone Tip: If you are considering completing a lot of landscaping changes to your yard, such as adding retaining walls, living walls or a swimming pool, be sure to include the outdoor kitchen as part of the overall design. Every kitchen needs a focal point and most outdoor kitchens center around the grill. Whether you choose gas or charcoal, your grill should serve as an accent to your space. When creating an amazing outdoor kitchen be sure to include a sink and a small refrigerator. Some outdoor kitchens are fitted with other appliances to make the outdoor kitchen feel custom. You can even add specialty appliances like a beer tap, smokers, hibachi grills and warming drawers. Be sure a licensed electrician installs your electrical connections so that your outdoor kitchen is up to code. Pizza ovens and tandoors are becoming increasingly demanding. When purchasing your appliances, be sure to order items that will make it through the seasons, both rain and shine. Stainless steel or ceramic appliances are very durable, require little maintenance and work in all weather conditions. Milestone Tip: Gas powered grills are a popular feature in the outdoor kitchen. If you want a plumbed gas line for your gas grill, you’ll need to hire a licensed professional and most likely file a permit with the city. Be sure you consult an expert for this aspect of the project. Your outdoor kitchen will provide a place to cook, eat and entertain family and friends. This area will become the center of your outdoor life and is an opportunity to enjoy the outdoor weather while having the comforts of your indoor space! Be sure you incorporate features that really make this space the center of your summer. Chairs, tables, decorative objects, specialty lighting and custom water features can complete the look while injecting your personal tastes in your decor. When it comes to furniture, choose sturdy pieces with comfortable outdoor cushions. Select the largest table you can for the space so you have, as you’ll be spending a majority of your time here. A water feature, such as a small fountain or pond can also lend a relaxing vibe to your outdoor kitchen. 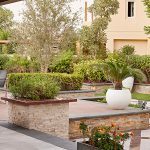 Some outdoor kitchens are being fitted with television sets, truly making the outdoor kitchen both the place to cook, eat, relax and entertain. Milestone Tip: If you have a small backyard try not to overdo it with an extravagant full outdoor kitchen. Sometimes less can be more. 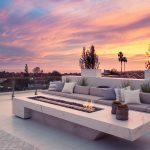 An alternative option is to build a BBQ island, which has all of the essentials from a grill to countertops and is a better fit for a smaller space and budget. The best outdoor kitchens are just as functional as your indoor kitchen, as welcoming as your living room, and as entertaining as your family room. An outdoor kitchen can be as simple as a grill, table, and chairs, or as elaborate as a fully outfitted kitchen complete with built-in appliances and seating. 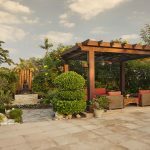 Although a homeowner can set up a simple and straightforward outdoor kitchen, designing a grand and impressive outdoor kitchen is best left to a professional like the design pros at Milestone. With so many different types of outdoor kitchens, designing the best kitchen for your family takes the time to plan and may require permitting from the city. Regardless of whether you hire a pro or not, you can follow the above tips to get started on the right foot. An amazing outdoor kitchen will provide all the comforts of home in the serenity of your backyard! Bon’ Appetite!